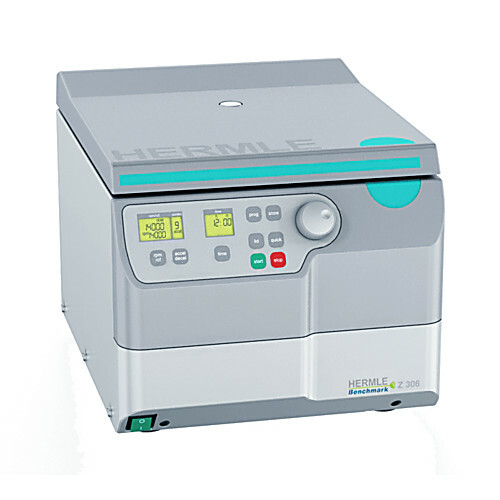 Pipette.com offers the complete line of Benchmark Hermle and Benchmark Centrifuges, Rotors and Accessories. 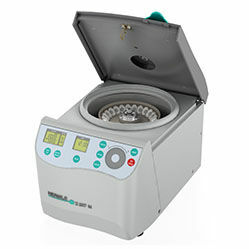 There is a broad selection of Benchmark centrifuges available at Pipette.com to meet a variety of centrifugation needs. Depending on the requirements of your lab, we have the Benchmark centrifuge that is perfect for your research or testing lab. Benchmark centrifuges are available in different shapes and sizes and with different features and benefits to each model to suit different tasks. The sizes of these centrifuges range from small and compact to large capacity units. While refrigerated or non-refrigerated units are also available. Different rotor options also exist to fit different tube/vessel types or strips. Centrifuges are designed to meet different needs such as quick spin downs, spinning clinical samples, large or small throughput sample numbers, and vessel volumes, long spin times or refrigeration requirements. 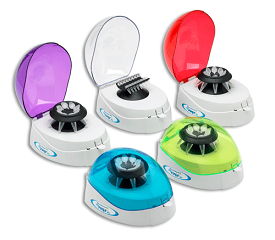 Benchmarks MyFuge mini centrifuge line is an affordable, flexible, and compact centrifuge that is ideal for cramped laboratories with limited benchtop spaces. With fixed speeds of 5,500 or 6,000 rpm, these mini centrifuges are designed for fast centrifugation in the laboratory where no specific speed is necessary. The simplest designs, silent operation, yet effectiveness make these mini centrifuges the perfect choice for fast centrifugation of microcentrifuge tubes and 5 mL centrifuge tubes. 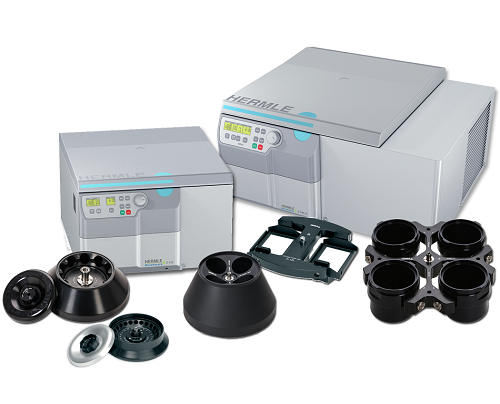 Benchmark has an excellent line of microcentrifuges that have a higher capacity than the mini centrifuge while also having a few more features. 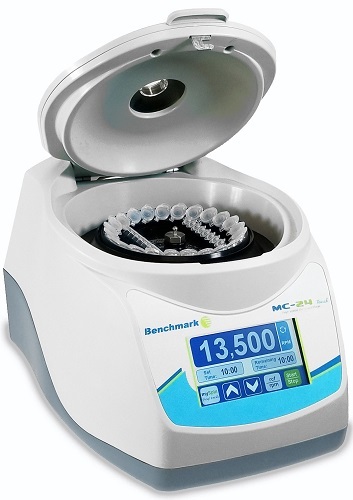 The Benchmark MC line of microcentrifuges feature combi-rotors or swing out rotors, a unique design among microcentrifuges. With large LED displays and variable speeds, the compact Benchmark MC microcentrifuge can fit both PCR strips, plates, tubes, and come with memory profiles for instant recalls during operations. 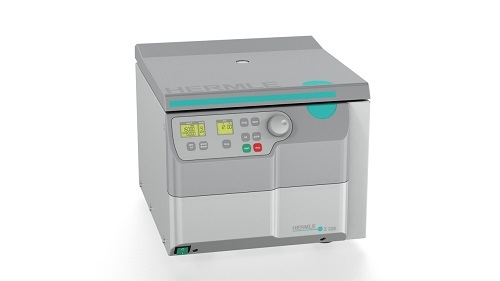 The compact centrifuges from Benchmark Hermle line have several different rotor adapters that can allow for swing-out angle or fixed angle and adjust to hold different amounts of conicals at different angles. 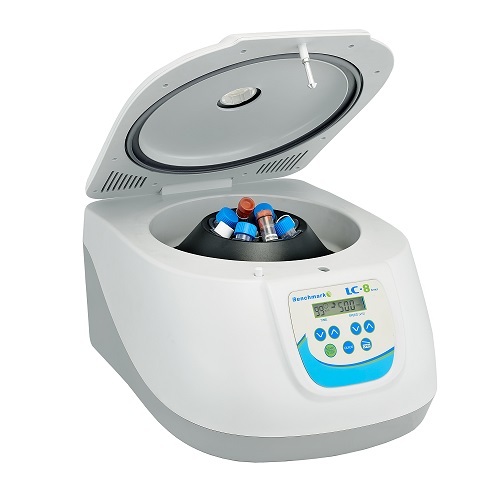 Cold room compatible, quiet operation, digital display, and designed with a timer, these compact centrifuges are ideal for laboratories that are doing more complex, timed centrifugation in different temperature environments. Refrigerated centrifuges are an innovative product with a unique design, built to make a change in the laboratory space. With high speeds of up to 16,000 prm, temperature control of -20 °C to +40 °C, and capacity of up to 44 microcentrifuge tubes, these high throughput centrifuges are the bee’s knees. 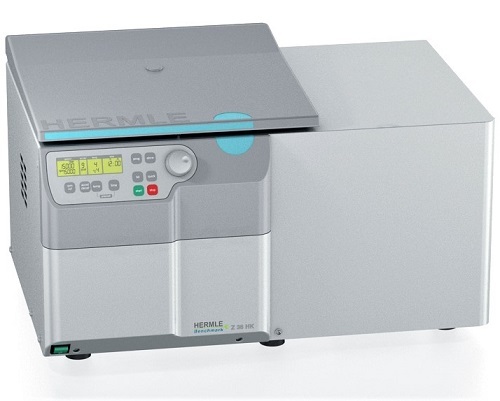 If you need exceptionally high speeds or high capacity in your laboratory for centrifugation, Benchmark Hermle has the perfect product for your lab. 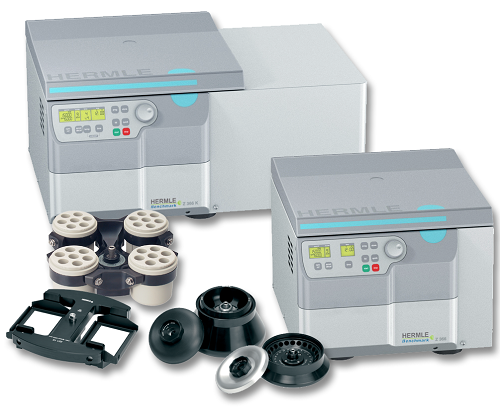 These centrifuges can produce speeds of up to 30,000 rpm and generate 65,395 x g. Along with the speed, multiple rotor adapters, and capacity of up to 44 microcentrifuge tubes or 68 centrifuge tubes, these Benchmark Hermle centrifuges provide the highest quality centrifugation on the market. Improve Yields by Centrifuging plates before PCR to ensure all reactants are in the bottom of the wells for proper concentrations. 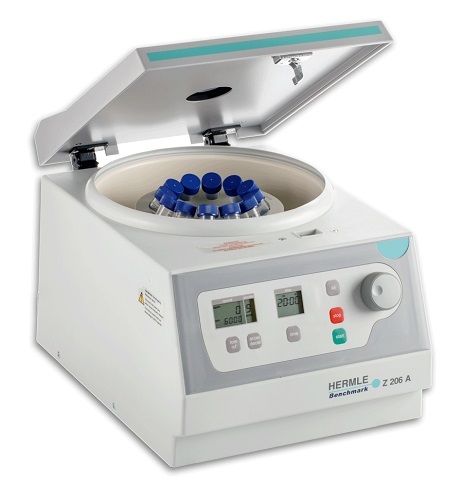 Hermle 2019 Centrifuge Bundle Deals- microcentrifuges to ultra-speed centrifuges are on sale. 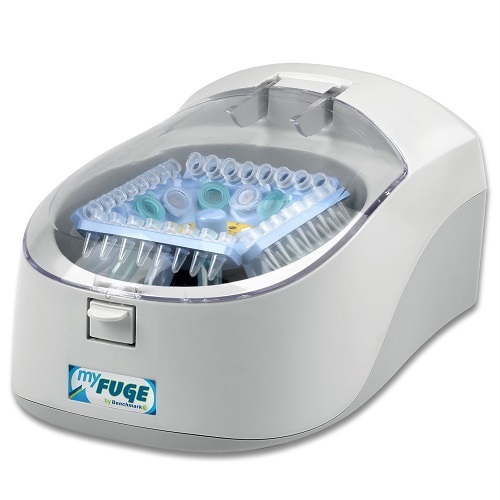 The Benchmark Centrifuge MyFuge 12 microcentrifuge eliminates the need to change rotors when switching between 1.5mL microcentrifuge tubes, 0.5mL microcentrifuge tubes, and PCR strips. 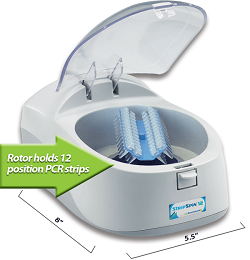 They included unique COMBI-Rotor which is all that is required to run 12 microcentrifuge tubes and or 4 PCR strips. 24-Place High-Speed Centrifuge with Full-Color Touch Screen from Benchmark Scientific. Three angle rotor options are available permitting use with all common tube sizes from 0.2ml to 50ml. A unique 6 x 5ml swing out rotor is also available for clinical applications requiring horizontal separation within 5ml blood collection tubes. Versatile high Speed Centrifuge with 17 Rotor Options and Maximum Speed of 23,542 xg. Compact, quiet, and powerful are just a few of the features found on the Z216 series microcentrifuges. 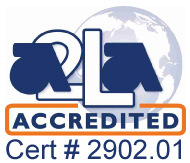 The Z216 centrifuges have a max speed of 21,379 xg and a max capcity of 44 X 1.5/ 2.0mL tubes. For quick spin-downs of 5ml centrifuge tubes. Includes adapters for 12x75mm tubes. Conserves valuable bench space. Starts and stops with closing/opening of the lid. Benchmark's LC-8 series of laboratory centrifuges is uniquely designed to meet a wide range of applications in both the clinical and research laboratory. Maximum capacity of 8 x 15mL tubes.